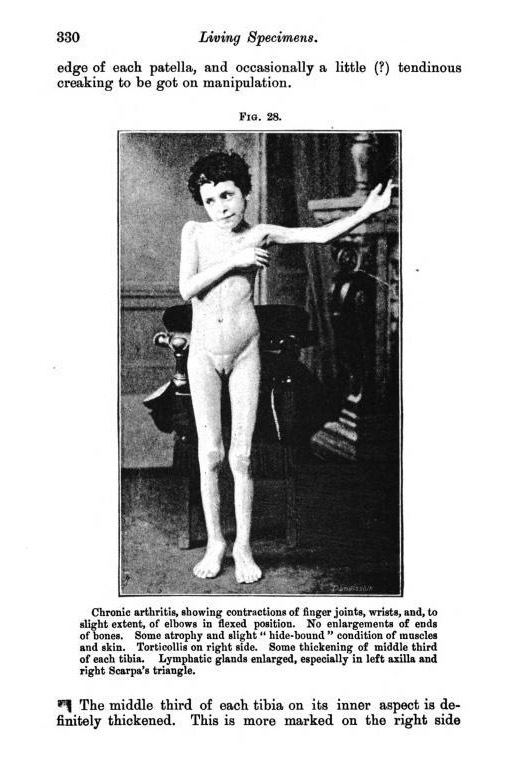 Case of chronic arthritis in a child, characterised by fibrous contraction of several joints and associated with some thickening of the middle of each tibia and with marked enlargement of groups of lymphatic glands. Description : pp. 328-333 ; ill.: 1 photo. ; 22 cm. Subject : Joints — Juvenile rheumatoid arthritis. Author caption: By THOMAS BARLOW, M.D. Exhibited May 24, 1889. Appointed Royal Physician in 1896, serving three monarchs over his career. Elected Fellow of the Royal Society for his work on infantile scurvy. President of the Royal College of Physicians, 1911-15. Eponym: Barlow's syndrome — mitral valve prolapse, causing mitral regurtitation. Eponym: Barlow's disease, Möller-Barlow disease — infantile scurvy (GM 3718, 3720). Barlow's papers archived at Wellcome. The condition of the hands is well shown in the photograph. There is hollowing of the palm, the metacarpo-phalangeal joints are slightly flexed, the middle phalanges are extended, the terminal phalanges slightly flexed. The extremities of the metacarpal bones and of the phalanges are not enlarged, and there is only the slightest possible indication of ulnar deflection of the digits on the right side. — p. 329.